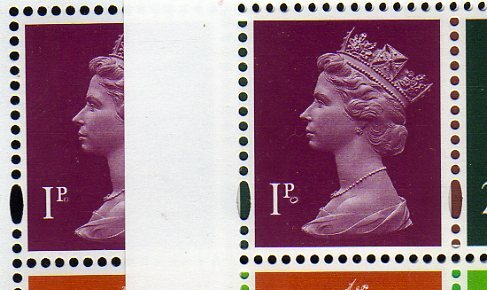 Two different ring flaws have been found on the 1p stamp in this sheet. From the position they could have the same origin - or they may be from two different parts of the press sheet. We have seen several of each in our stocks - also on FDCs, now available on our e-commerce site. In printing terms, this particular sort of defect is known as a 'hickey' - caused by a foreign object on the plate or blanket, sometimes dried flecks of ink. Very bad for a printer's quality control to let this through. IE: The smaller ring on the left is placed higher than the one on the right, but saying this it could be they are caused by the same flake or foreign object that has moved during production.